A few weeks ago I won a tofu press. I’ve been wanting one for a few years but I couldn’t fathom paying 40 dollars for 2 boards that squeeze water out of tofu. But now that I won one I couldn’t wait to try it. It turns out that it would have totally been worth 40 dollars. The tofu press really squeezes the water from tofu making it really firm. I thought squeezing it myself was good enough but the texture of the tofu was nothing compared to what it’s like after being pressed. I’ve been making tofu even more then usual because of how much I’m loving the texture of the pressed tofu. 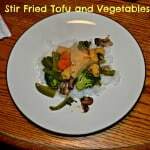 I found a fun recipe for tofu fries and couldn’t wait to try it. 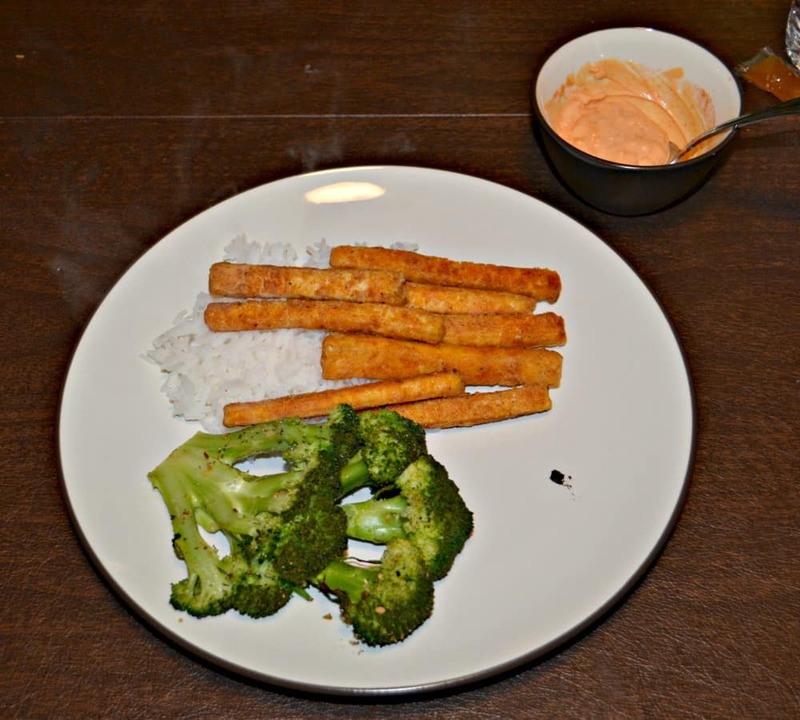 The tofu strips are oven fried and served with a spicy Sriracha mayonnaise dipping sauce. 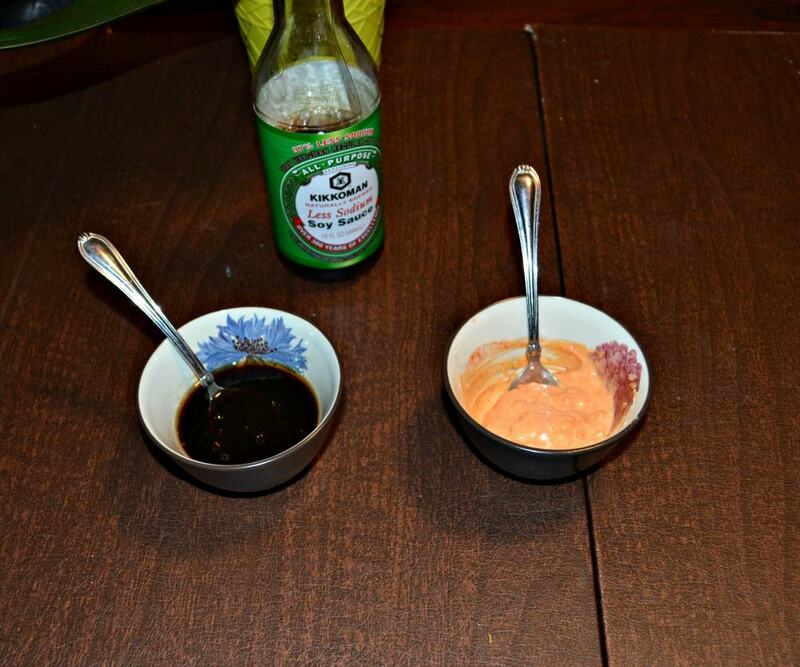 I also made a sesame soy dipping sauce. The recipe also has broccoli steaks with it. I thought that was odd but I do love broccoli so we tried it out. It’s basically heads of broccoli slice into 1 inch thin “steaks” that are then oven fried with salt, pepper, and seasonings. They come out roasted to perfection and are so flavorful. 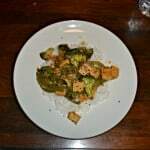 The combination of the tofu and broccoli was great! It was a surprisingly filling meatless meal that could actually be vegan without the mayonnaise. The tofu fries come out firm and crispy and lightly seasoned. They are great with the dipping sauces, especially the Sriracha Mayonnaise one. 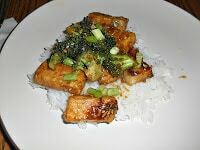 Then then broccoli steaks are a nice accompaniment to the tofu. The are firm and tasty. 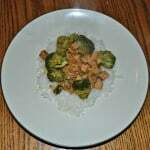 I served everything on a bed of jasmine rice for a complete vegetarian dish. Tofu cut into strips and fried in the oven served with Sriracha Mayonnaise dipping sauce served along side seasoned broccoli steaks. Place the tofu in a tofu press. Press the water out of the tofu. This will take about 20 minutes. Place a jelly roll pan in the oven. Preheat the oven to 500 degrees. Cut the tofu into 5 pieces. Cut each piece into 5 thin strips. Sprinkle with half the salt. Place the cornstarch, garlic powder, onion powder, paprika, and pepper in a dish. Mix well. Dredge the tofu through the cornstarch mixture, gently shaking off the excess. Remove the pan from the oven and pour the canola oil in the pan, tilting to coat the pan. Place the tofu fries in the pan. Bake at 500 degrees for 10 minutes. Cut the broccoli into 1 inch thick strips. Place in a bowl with the water and heat in the microwave for 3 minutes. 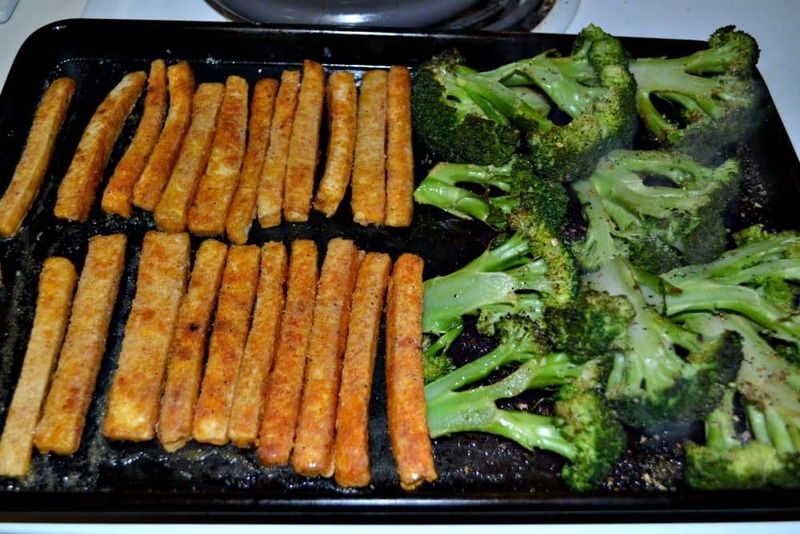 Remove the pan from the oven and turn the tofu fries over, pushing them to one side. Place the broccoli steaks on the other side of the pan. Sprinkle with soy sauce, lemon pepper, and remaining salt. Bake for 10 minutes. Remove from oven and flip the broccoli over. Bake for an additional 5 minutes. Meanwhile, combine all ingredients for the Sriracha Mayonnaise. Set aside. 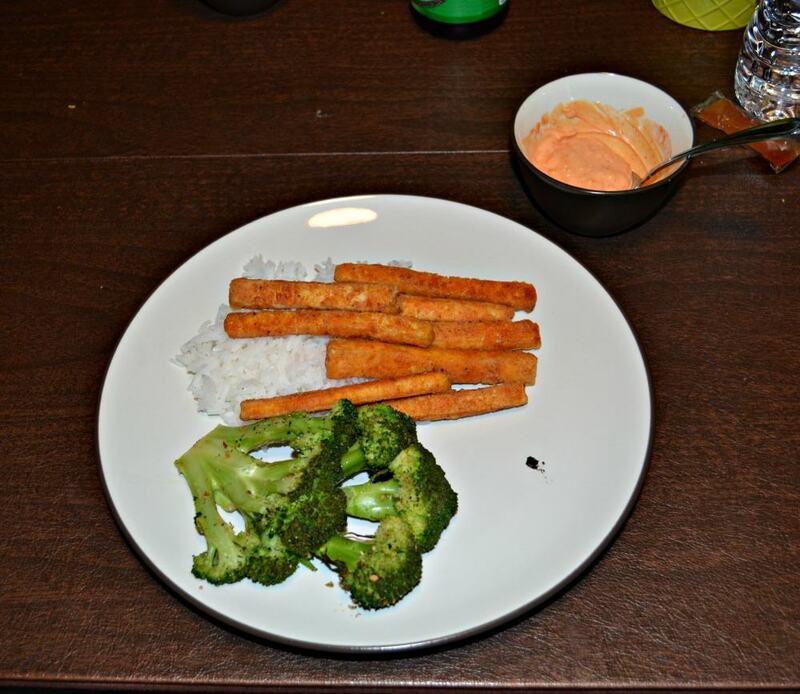 Serve tofu fries with the Sriracha Mayonnaise and broccoli steaks. I just recently got a tofu press and it makes SUCH a difference! These fries are totally worth squeezing out the water. Creative way to enjoy tofu! I never heard of a tofu press but I see it opens up some great possibilities like these tofu fries! It’s awesome. If you eat tofu a press makes so much difference!